Martial Arts Training to the Girls Students in TS Girls High Schools-Instructions: Training of Martial Arts to the Girls Students in (5111) Girls and Co-education High schools. School wise amount sanctioned with certain instructions - Guidelines for implementation of the Martial Arts Training for the year 2016-2017. & EX-OFFICIO PROJECT DIRECTOR, RMSA, TELANGANA, HYDERABAD. 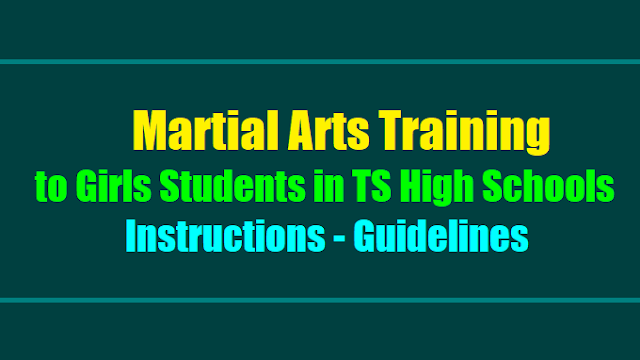 Sub:- RMSA - Telanqana- Hyderabad - Training of Martial Arts to the Girls Students in (51 '11) Girls and Co-education High schools for the year 2016-17 - School wise amount sanctioned with certain instructions - Guidelines for implementation of the Martial Arts Training for the year 2016-2017 -Issued - Reqarding. Read: 1.RMSA Annual Work Plan and Budget 2016-17 approved by the Govt. of India. 1. The activity should be planned to take up for 3 months in all workinq days focusinq on self defence skills from 20.11.2017. 2. In the schools where PETs/PDs/Part Time lnstructors(PTl)(Physical Education) are not working the SMDC will take responsibility to engaging the services of District Sports Authority empannel I recognised Agencies in Martial Arts, in self defence who can impart training or to engage instructors /Masters on part time basis from the locality. He /she will be paid Rs.8500/-· for entire course of 3 months and also take responsibility in monitoring the attendance and payment of Honorarium to trainers/instructors. 3. Classes should be conducted in PET /Garnes period. 4. Competitions should be conducted every fortrrlqht or monthly within the school, inter schools and Mandal level. 5. The Headmaster will send fortnight reports and photos of the Martial Arts · training programme to the District Educational Officers and the Slate RMSA Office and Cc'3..DSE whatup group. In view of the above, all the District Educational Officers in the State are requested to instruct the Headmasters concerned to issue instructions to the PETs/PDs to train the Girls students as per the above Juidelines for implementation Martial Arts training programme for the year 2016-17. 1) Proc of the DSE&EX-Officio Project Director, Telangana Hyd Rc. No. 133/ RMSA/TS/2015 Dated: 17.10.2015. 2) 46Th P.A.B. held on 5th Feb - 2015 to Consider the AWP&B 2015-16 of RMSA. While enclosing a copy of the Proceedings with list of High Schools show in the reference cited the Deputy Educational Officers, Mandal Educational Officers and Sectoral Officers of SSA are instructed to visit the Schools show in the list and furnished the report on the Martial Arts Training Programme which has been approved by the Gol MHRD New Delhi through the reference 2nd cited which will be commencing from 02-11-2015. The Head Masters Concerned are instructed to engage the Trainees/Instructor as per the Guidance issued in the reference 1St cited and follow the guidelines scrupulously and report compliance to the under signed & Director of School Education & Ex-Officio Project Director, Telangana Hyderabad and they are also instructed to submit the Fortnight reports a1d Photos of the Martial Arts Training Programme to this office and Director of School Education & Ex-Officio Project Director RMSA, Telangana Hyderabad. Subject: RMSA- Telangana- Hyderabad- Training of Martial Arts to the Girls Students in 1836 Girls High Schools- certain instructions –issued Regarding. Reference: 46th P.A.B. held on 5th February 2015 to consider the AWP&B 2015-16 of RMSA. All the District Educational Officers in the state are informed that, the GoI, MHRD, New Delhi has approved an outlay of Rs. 165.24 lakhs for Marshal Art Training under RMSA component to all the Girls in 1836 Girls High Schools of Telangana State in PAB 2015-16. But as per UDISE data the available Girls High Schools are in the state is only 768 and remaining 1068 Co-Edn schools including KGBVs are taken up as per the Girls Enrollment. The district wise schools are as follows. The list of schools is also enclosed herewith for read reference. It is also informed that an amount of Rs. 3000/- per month for 03 Months to Trainer / Instructor in 1836 High Schools. (Rs. 3000 x 3 months x 1836 Schools = 165.24 Lakhs) have been approved under Recurring component of Martial Arts. This amount will be released directly to the SMDC account of schools. The following guidelines have been issued for implementation of the Marshal Arts to the Girls Students. classes will be conducted in PET/Games period. In view of the above, all the District Educational Officers in the state are requested to issue necessary instructions to the Headmasters concerned to engage the Trainer/Instructor as per the above guidelines and report compliance to this office. Further they are also requested to instruct the Dy.Eos, MEOs & Sectoral Officers of SSA to visit the said schools and furnish the report on the Marshal Arts training progamme. This has got the approval of the Director of School Education & Ex- Officio Project Director, RMSA, Telangana , Hyderabad.